2000AD comic Prog #339 (22nd October 1983) | 'TAIN'T THE MEAT… IT'S THE HUMANITY! 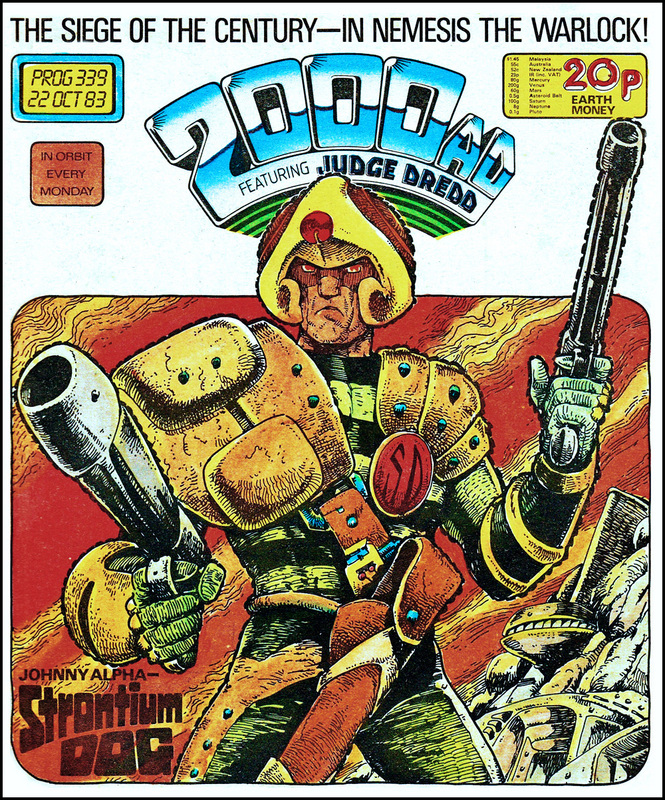 Here’s another classic cover from weekly British science-fiction comic 2000AD, this time featuring Strontium Dog Johnny Alpha. The cover to Prog #339 (cover dated 22nd October 1983) featured artwork by 2000AD fan-favourite Carlos Ezquerra and starred Johnny Alpha, a mutant bounty hunter (or ‘Strontium Dog’) from the near future. Ezquerra co-created the strip along with John Wagner (with whom he also created Judge Dredd) for the short lived comic Starlord, a sister title to 2000AD. When Starlord faltered the Strontium Dog strip transferred to 2000AD when the two titles were merged in October 1978. This cover is classic Ezquerra – an iconic, striking image of a no-nonsense Johnny Alpha. I’m a great fan of comic book artists who have a unique drawing style and Ezquerra certainly has that – there’s no chance of reader’s confusing his work with an other artist. The spanish born Ezquerra has a style that is distinctively European yet still works well within the confines of traditional British comics. I particularly like the distinctive think black brush strokes he applies to the outside edge of his characters, they really make them jump out from the background. Happily the rest of Prog #339 is equally solid. Judge Dredd kicks off the issue with part 5 of The Graveyard Shift (drawn by Ron Smith, one of my favourite Dredd artists), followed by celtic fantasy Sláine. Nemesis The Warlock received the coveted full-colour centre spread treatment (featuring artwork by Kevin O’Neill at his outrageous best). Part 5 of the Strontium Dog story The Moses Incident followed with future soldier Rogue Trooper rounding off the Prog. Since it’s launch in 1977 2000AD comic has succeeded in creating some of the strongest, and boldest, covers in the British comic book market, and this classic cover by Carlos Ezquerra is no exception. This is the second cover by the artist that I’ve showcased over the last few months (click here) and it certainly won’t be the last. Coming soon: a classic Rogue Trooper cover by Dave Gibbons.